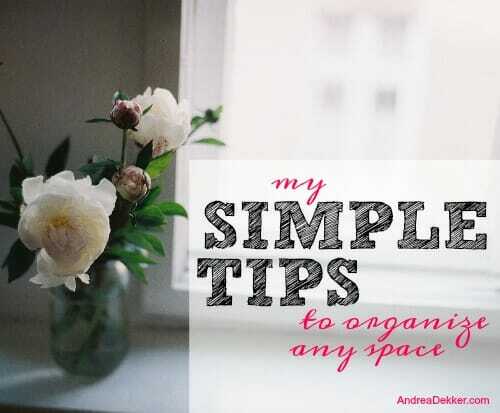 After 7 years of blogging, 2000+ published blog posts, more than 10 years of running my business, and a lifetime of striving to simplify and organize my own life, I was shocked and slightly embarrassed when I recently realized that I’ve NEVER shared my most favorite super simple tips for better organizing almost any space in your home. I have shared these tips verbally at hundreds of different speaking engagements over the past several years, I have recited them to friends and family who ask for my advice, and I have replayed them over and over in my own thoughts as I continually weed through various closets and cabinets in our home. I was so extremely positive I had published these tips somewhere on my blog that I actually spent over 20 minutes searching for the post last week. However, much to my surprise, I never found it. So… today is the day when I finally share my tips with you. In writing! If you are trying to better organize any space in your home, I feel confident these “SIMPLE” tips will help you! I know it’s not always fun to think about starting small — after all, we see the huge makeover shows on TV and want our home to have a similarly magical transformation. Unfortunately, that’s not how the real world works. Organization takes time, energy, sometimes money… and it definitely doesn’t happen overnight. And while I know how exciting it might sound to work all night long to finally finish your big organizing project, I have a feeling if you do the ‘work all night long’ thing too many times, you will completely burn out and decide you hate the whole concept of organizing. My advice (and something I do regularly in my own life) is to pick one small area, set your timer for 15-20 minutes during a time when you won’t be interrupted, and work as quickly as you can without letting yourself get distracted by other things. For example, pick one drawer in your kitchen, one shelf in your closet, or one basket in your bathroom and work to declutter and organize that one space in roughly 15-20 minutes. Don’t worry about the rest of the kitchen, closet, or bathroom — you can tackle another area tomorrow or the next day. Don’t wait until tomorrow. Don’t wait until someday. Don’t wait until you have a day off work. Don’t wait until you’re less tired. Don’t wait until your kids are older. Don’t wait until your spouse is ready to help. Just do something NOW — today, immediately when you get home. You don’t need to reorganize your entire home — just start small, set your timer and do something right now! If you don’t have a place to put your things, your things will sit out. If your things sit out, they will be clutter. For example, if you don’t have a space for your craft supplies so you just store them on the kitchen table, you’ll most likely need to move them when it’s time to eat. So you move them to the couch — but then want to watch TV after dinner. So you move the craft supplies to your bed — but when it’s time to go to bed, you have to move them yet again. Save yourself a WHOLE bunch of moving and rearranging and just create a space for your things once and for all. And if you can’t create a space, my honest advice would either be to get rid of the items or purge something else to make the space. I could talk about planning ahead until I’m blue in the face, but the truth is, it’s impossible to realize the benefits of planning ahead until you actually DO IT. And if you aren’t planning ahead right now, chances are you’re over-tired, over-worked, over-stressed, and can’t possibly imagine how you could work in enough time to prep tomorrow’s breakfast, make tomorrow’s to-do list, and pick out tomorrow’s clothing. Start small (choose one area to start planning ahead) and do it NOW! The things in our home are often very emotional and sentimental for so many people (if this is you, don’t worry, you are probably in the majority)! And when it comes to purging, decluttering, donating, and clearing things OUT of our homes, emotions can really get in the way of forward progress. Not only can emotions cause you to second-guess every decision to purge anything even slightly memorable, they also make it really easy to get sidetracked in the middle of a project (oh, let’s just look through all my old photo albums for a minute… or let me just read a few of these old cards and notes). There is no great way to simply “leave your emotions out” if you are an overly emotional and sentimental person — but I do think it helps to be aware of your emotions before you start an organizing project. Don’t tackle your child’s baby pictures the week they head off to college and you miss them terribly. Don’t weed through baby clothing during a time when you are overly sad about that past season of life. Don’t try to purge your grandmother’s belongings on the anniversary of her death. Instead, choose a time when you feel more level-headed about things and continually remind yourself to leave your emotions out of your decision making process as much as possible. In my opinion, it’s always easier to stay on-task and motivated if you have some sort of accountability. I should mention that an overly sentimental mother, sister, or friend are not good choices for accountability partners (at least not when it comes to purging your unneeded clutter). Choose someone who is not attached to, or sentimental about, your things. Choose someone you can trust to give you good advice. Choose someone you know will be honest with you and not just tell you what you want to hear. Tell them your goals, tell them your plan, and ask them to continually check in with you to see how much progress you’re making. You could even offer to have their family over for dinner once a month as an incentive to keep your home neat and organized. Whatever the case, I’m positive you will make more progress if you have someone to keep your accountable. As I’ve mentioned many times before, getting organized is not necessarily “easy” but it can be a very “simple” process if you are diligent and continue making forward progress. Which of these tips resonates most with you? Inspiration for Our Kitchen Renovation! I really need to focus on the small chunks of time to at least do SOMETHING, and planning ahead for meals. And as encouragement to you, in regards to “exercise”, all the walking you do is fabulous. So don’t sell yourself short in that regard! I love this. I think this might be the piece missing for my yearning toward simplicity and minimalism. I go through it all, but I do not have great storage in places. When it sits out even if it is not nearly as many things as it used to be or others have, it still looks bad. I need to make a space for it because I hate clutter! She called the other day when I was trying to purge toys (unsuccessfully). She offered to come over to help. I declined. When she asked why, I told her that I wouldn’t be willing to let her purge my stuff any more than I could let myself purge it. Today I considering it a success that I have one plastic bag of clothing from my closet to donate. (I was hoping for over 100 items but I just couldn’t do it!). Out they will go before I change my mind! I am thankful both of our dads saved things from our childhood, but I will say that my father-in-law saved so much stuff that was kind beat up and missing things. And after my kids played with it a few times, it got thrown away. If I could go back in time with him, I’d remind him that as a family we already have enough stuff. Save a few things and take pictures of the rest for memories! To this day my father-in-law is the only one in state and is trapped because he has too much stuff to move. When parents keep a lot of stuff, it can actually be a burden for their kids. I have to remind myself of this! I do like the tip to take pictures of things instead of saving them. My kids honestly have so much fun looking at pictures of themselves with old toys and clothing — they have never once asked if I actually saved the toy or the article of clothing. haha — yes, get those clothes out of the house before you change your mind! Love the idea of one drawer at a time. I recently made a checklist listing all the drawers and cabinets in my kitchen so that I can go through one at a time and clear out the clutter. It’s quite a motivator to see them checked off even though it only takes 15-20 minutes to complete one! Next up, all the drawers in the bedroom dressers. it really does seem much less overwhelming to focus on really small areas (like one drawer or shelf at a time). I’ve found that the best time to get rid of children’s clothes is immediately after they have outgrown them. I do not keep anything to save for the next consignment sale, I go ahead and sale any smocked items I can to friends and then take the rest and give them as hand-me-downs. It’s much easier to get it out right away then to hang on to it and later get emotional over certain items. I am amazed at friends who let me go through their kids’ things but then they hang on to the rest for years. I have a medium-size bin I keep in the kids’ closets and once it’s full, I donate it (or, in Simon’s case, pass it along to James). Your blog is universally appealing, and I look forward to it every morning. Thanks you! I did my big decluttering maybe 15 years ago before I retired, and I did a bit more when we downsized thereafter. I continue, as we all do, in maintenance mode. What is different in my case is that I DID start large, and went through everything in about 2 days that first time. My husband was on a trip, and I stayed at it till I felt more comfortable with my home. I came close to the Kon Mari method (not in conversations with objects or folding methods–just clearing out), clearing types of things no matter where in the house they were: books, clothes, kitchen supplies. For those with no kids around any more and perhaps a traveling spouse, this mad-woman method of blitzing through should not be discounted. Years later I am able to keep on top of clutter, organization, and feeling free. I admittedly am a naturally neat person, but before the big clean-out I was so busy with teaching and family that I wasn’t thinking about my closets that much. Once I did awaken to it, I had to get at it. Very cool comment! Love this. Love this comment & in my opinion, it seems like teachers are usually very organized people!! Yay!! This is so great to hear! And yes, there is always a maintenance mode — no matter how organized you are, no matter how big of a purge you did once, there is always maintenance!